Narishige – Micromanipulator NM25 | EINST Technology Pte Ltd. Thin body design for multi-channel recording. The NMN-25 features a thin driving unit for multi-channel recording. 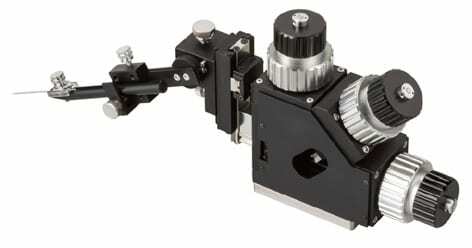 In addition, the placement of knobs in one direction enables several manipulators to be installed and operated close together without interfering with each other. Use of an isolation table makes it easy to install multiple manipulators. The holder fixing section also has a sliding mechanism which provides up and down movement of an electrode and tension adjustment to hold it. Like the NMN-21, which was developed for patch clamping, this manual manipulator integrates coarse and fine movements, and employs a body design which absorbs vibrations. As a result, operation is precise and stable, free from concerns about drifting and electromagnetic disturbance. * For attachment to the microscope, a suitable mounting adaptor is required (sold separately). * The micromanipulator can be mounted directly on the isolation table. *Patch Clamp Headstage Holder (sold separately) can be attached to the dedicated universal joint included with the micromanipulator.